Talking about the respiratory system is another ploy of mine to try and convince you to quit smoking. 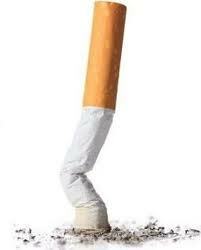 Perhaps if you can visualise what happens inside your body everytime you smoke it might make you stop and think. 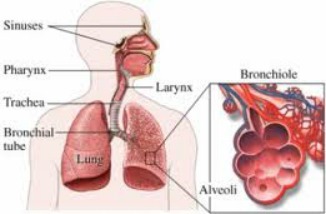 When we think of the respiratory system we think of pulling air into the body and exhaling it out of our body. But there is more to it than moving air around. All the cells in our body require energy for maintenance, growth, defence and division. The first and foremost avenue for our cells to obtain that energy is from aerobic mechanisms which simply means - requiring oxygen. Our aerobic respiration requires the taking in of oxygen and the production and expulsion of carbon dioxide. The exchange (or diffusion) of oxygen and carbon dioxide takes place in the lungs which are a moist, warm protective environment. Diffusion occurs between the air and the blood. This means that when we breathe in and air enters our lungs our circulating blood takes up the oxygen and transports it to all the cells in our body. Our circulating blood also transports the carbon dioxide which has been generated by our cells and delivers it for expulsion by the lungs. Of course our respiratory system is responsible for a lot more but because we are talking about the harm that smoking does we are only looking at the gas exchange that occurs. So there are millions of extremely fragile alveoli within the lungs providing a large surface area for gas exchange to take place - gives oxygen to the blood to be transported to all the cells in the body and takes carbon dioxide from the blood to expel from the body. Imagine those millions of delicate alveoli that just want to take in oxygen but instead get to take in tobacco smoke and 599 chemicals instead. After a while the alveoli become thick with mucous but they still battle on to do their job. Now though, they are not able to do it effectively so our body does not get the oxygen needed and we are stuck with carbon dioxide in our cells. I did this to myself for 28 years and it disturbs me now to think of the repair job those little alveoli are trying to do. For some people (like my Dad) it will be too late. The damage to the alveoli is too great and the result is emphysema. Other lung diseases you might get such as lung cancer or pneumonia or even regular bouts of pleurisy can all be due to your genetic make-up. My family has no history of cancer but many family members have emphysema or suffer from chronic bronchitis. You might be "lucky" and not get any of these lung diseases but your body will still struggle through life with pain and very little energy simply because the alveoli are being destroyed and cannot function properly anymore. Return from "Respiratory System" to "How to Quit Smoking"